"In anticipation of Lilith, we wanted to offer unique pre-sale bundles that are special to us. Not only do we have the album, limited edition vinyl, and t-shirts up for grabs, but we are also offering limited edition items curated by myself and Heidi. One such item is a gorgeous lyric book for Lilith featuring never before seen illustrations by me and graphics by Heidi. Another item is our signature Lilith pendant, a darling necklace handcrafted by us for our Butcher Army. 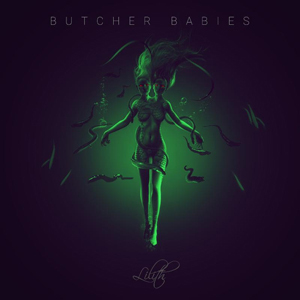 You can find all the details on our pre-order site www.ButcherBabiesOfficial.com"
"After a year of writing and recording we are thrilled with the growth and maturity of this album. Leading with our title track "Lilith", the artistic development within the band shines. We worked with producer, Steve Evetts to bring you the rawest form of BUTCHER BABIES. No auto-tune, 100% real drums, real guitars, real bass, and an all out BUTCHER BABIES assault on your senses. As we know in this industry, these standards are quickly replaced by machines and can eliminate what makes a band an actual band. We are so proud of the hard work and dedication that each member of our team put in to create this masterpiece." BUTCHER BABIES will make their much awaited return to the road in North America alongside HOLLYWOOD UNDEAD as part of a two month run in the states. With shows already sold out in Hollywood, Des Moines, St. Louis, and Madison, WI, fans can find a complete list of dates below.